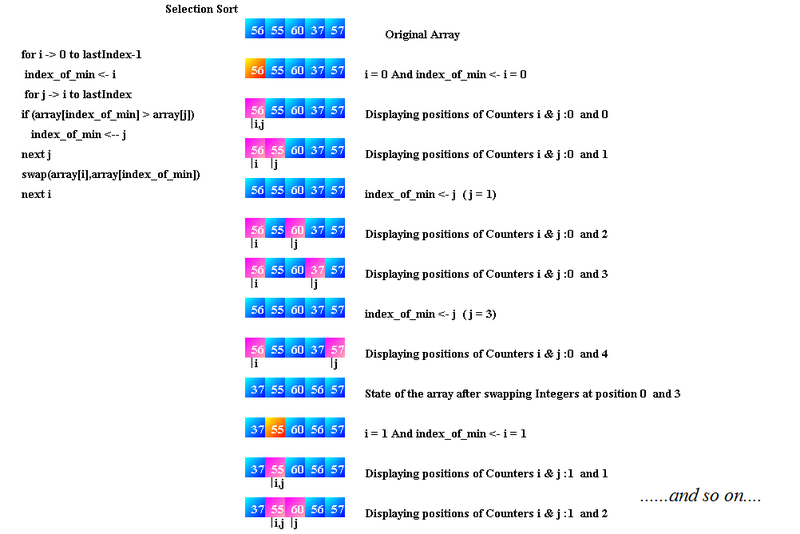 The idea of the selection sort is to find the smallest element in the list and exchange it with the element in the first position. Then, find the second smallest element and exchange it with the element in the second position, and so on until the entire array is sorted. For every index from 0 to number_of_elements-1, we find the element which is appropriate for that index and we swap the element which is already there with the element which has to be there. Finding the element which is appropriate for an index is simple. We just have to find the minimum value which is there from that index till number_of_elements-1. the value at current index and we update it in a for loop. element smaller than minimum then update minindex to be that index. 4. Follow the first three steps for every index from 0 to number_of_elements-1. Best case performance – When the list is already sorted O(n2). Worst case performance - When the list is sorted in reverse order O(n2). Average case performance – O(n2). O(n2) time complexity makes it difficult for long lists. find the minimum value which is there from that index till number_of_elements-1.